Ogijima is a small island with a small community. The area is small enough that it can be considered a single area but it is split into two distinct geographical sections. The main “Community Area” is Ogicho and has most of the art. Most of the art opens at 9:30, 30 minutes after the first ferry arrives. 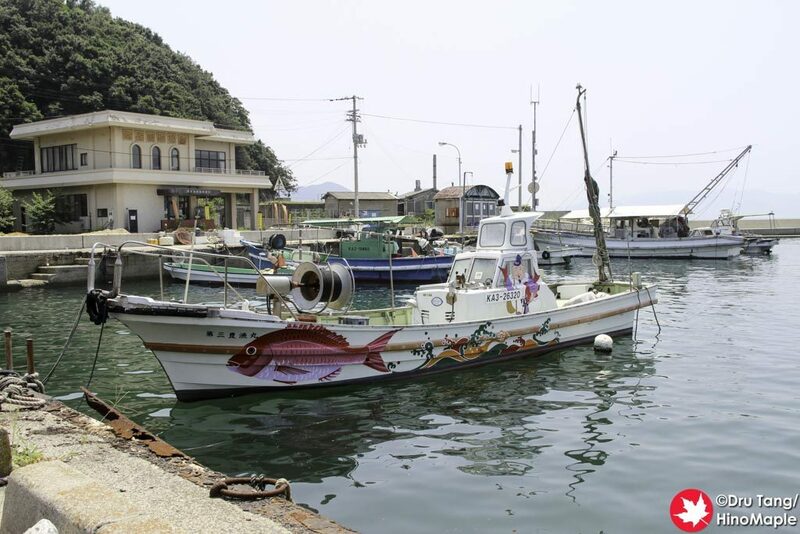 If you arrive early, it is recommended to head to the Ogi Fishing Port Area where all artwork is public. It isn’t a far walk but Ogicho and the fishing port area do have a different feel to each other. Ogijima’s Soul by Jaume Plensa is a very beautiful artwork. 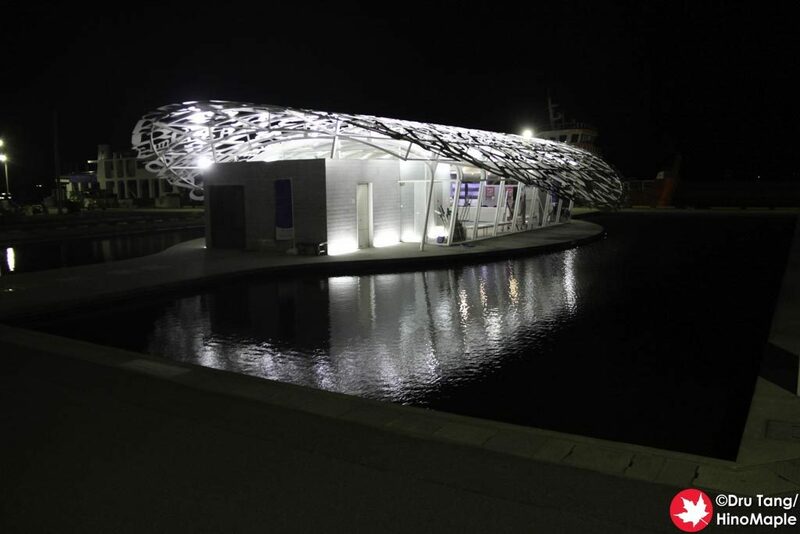 It is an architectural artwork that is used as Ogijima’s terminal building. It is a simple glass box with a beautiful roof. The all white roof consists of letters in no seeming order. It is one of the most photographed objects in Ogijima for obvious reasons. I consider it to be the symbol of Ogijima, although there are a lot of those. Every time I return to Ogijima, I know I’m there when I see this building and it always puts a smile on my face. 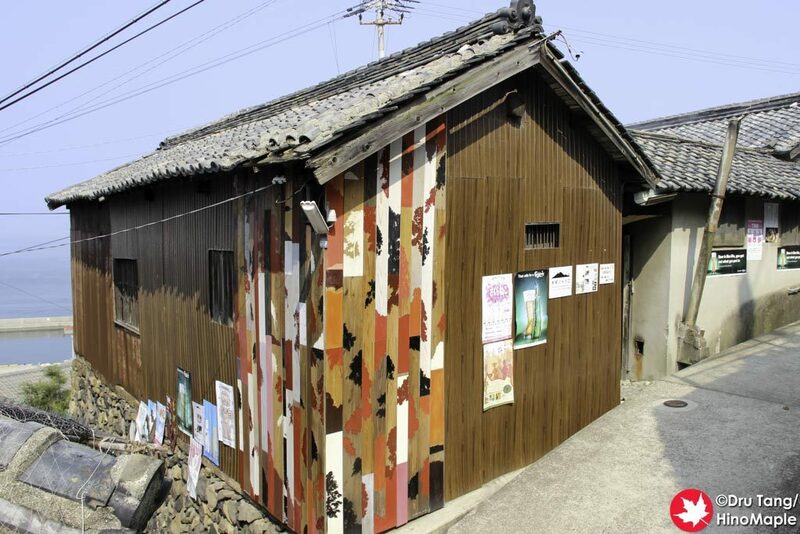 Ogijima Wallalley is a great artwork that spans the entire village on Ogijima. 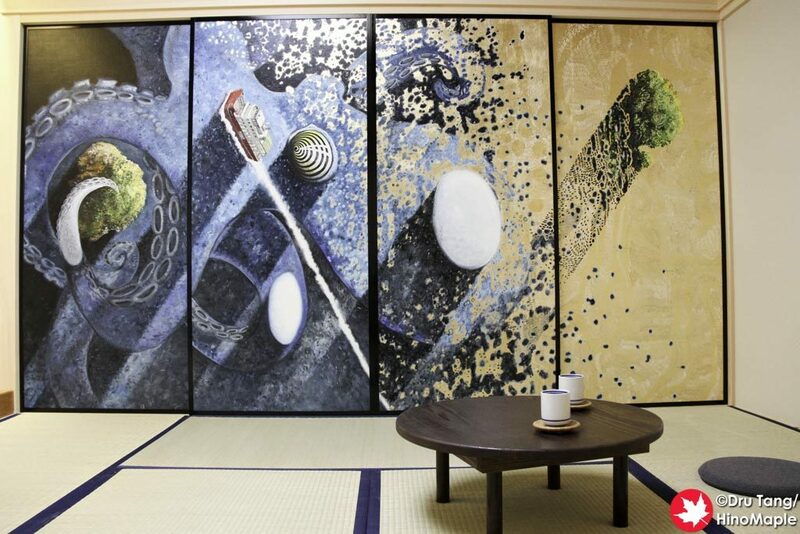 Rikuji Makabe took various boards and painted them with a few different patterns. He then cut them and mixed them together and installed them on various houses throughout the village. As you walk through the village, you can see these boards in various places making a sort of Easter egg hunt where you have to find all of them. 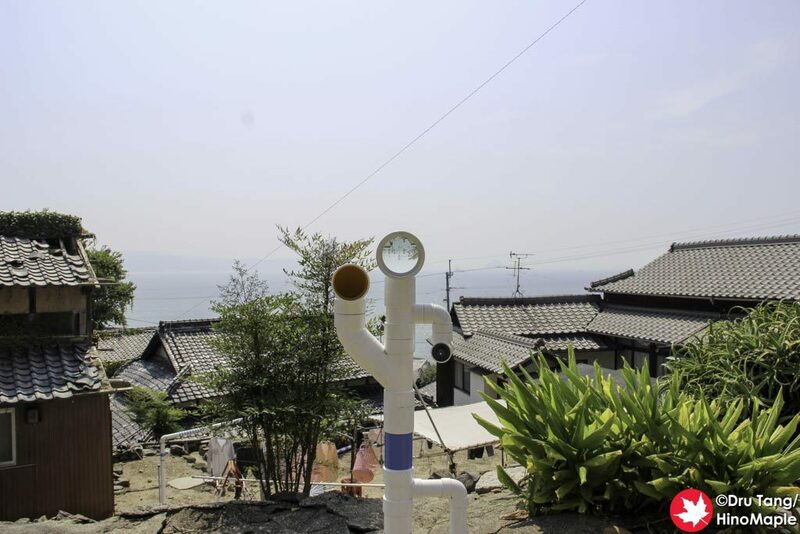 Lighthouse Keeper by Minouk Lim is a new for 2016 Setouchi Triennale work. 3 years ago the same building was Corridor of Time. Things have changed a little with the front of the building sporting a new disco ball at the top as well as a few lenses on the wall. It kind of evokes the idea of a lighthouse without the physical light. Inside, Ms. Lim’s fascination with lighthouses comes shining through as you get to see various lighthouses and the various Fresnel lenses inside; it is as educational as it is fascinating to see the various light houses all lit up in the dark room. ONBA・FACTORY has been a long term project by Onba Factory. The onba are simple push carts that the people of the island use to move goods around. Yoshifumi Oshima is the designer and he has made various designs from a Citroen to Meon replicas. The carts themselves are well used by the locals as they need to get goods from the ferry back home. The factory has several of the onba on display and a history of most of the onba that have been made. If you are ever at the pier when a ferry comes in, just wait 10 minutes and you’ll see some of the old ladies come in and pick things up with their onba. KALEIDOSCOPE BLACK & WHITE is a very interesting artwork by Takeshi Kawashima & Dream Friends. It is in the back of the Dream Cafe and 3 years ago they did a work called Time Tube in the same place. Time Tube was a bunch of magazines rolled up and placed strategically. It was okay but KALEIDOSCOPE BLACK & WHITE is a completely different artwork. The whole artwork is like being inside a big kaleidoscope and you really feel a bit crazy inside. There are even small shirts that you can put on that have the same design to make you literally part of the artwork. You can buy them too if you want but I was a bit too overheated to really think about doing so. I wish I could go back and really enjoy the artwork but thankfully I have enough pictures to relive the experience. Note: Technically Dream Cafe is in front of KALEIDOSCOPE BLACK & WHITE rather than KALEIDOSCOPE BLACK & WHITE being behind Dream Cafe. 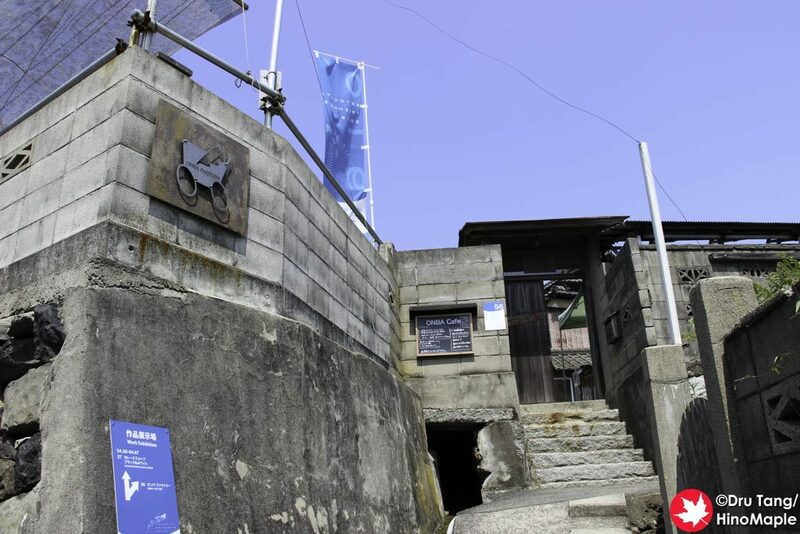 Dream Cafe is generally closed outside of the Setouchi Triennale. 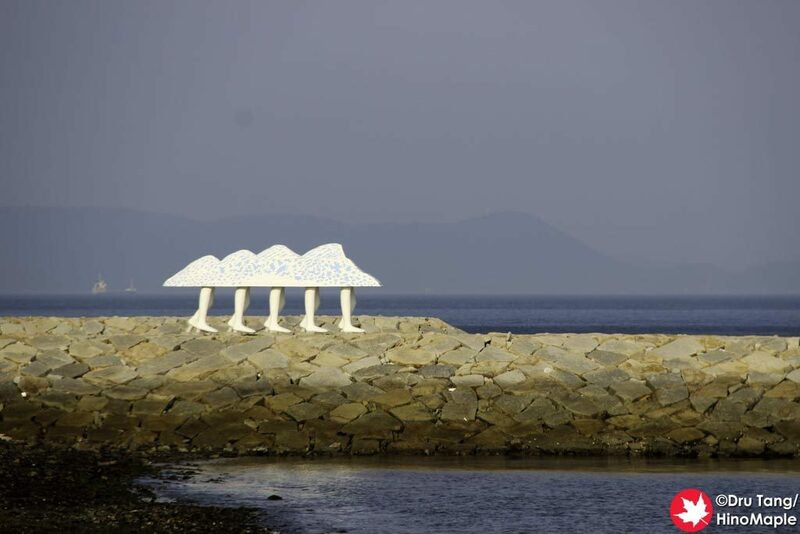 Akinorium by Akinori Matsumoto is one of my favourite artworks on Ogijima and my favourite new one on the island. Utilizing shadows, bamboo, and servos, Mr. Matsumoto was able to create a wonderful moving art piece that also plays music at the same time. The music is basically various sounds that seem to be random but I can’t help but feel that it was planned in a way. It is something that must be experienced in person and no photos or videos can do it justice. 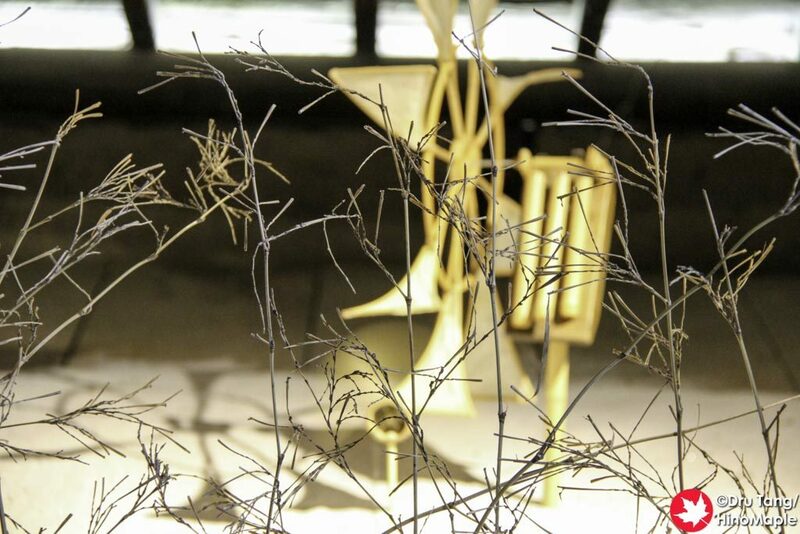 SEA VINE is a beautiful returning work by Haruki Takahashi. I was amazed by this artwork 3 years ago and couldn’t wait to return. 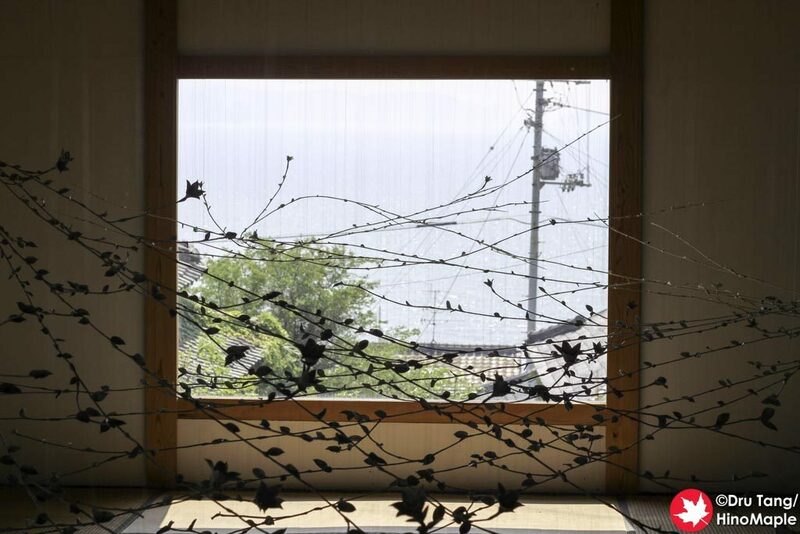 Delicate strings are suspended in the middle of a tatami room with porcelain petals. I can’t remember the original very well but I was told that the vine has grown in the past 3 years. When I went, it did feel a bit bigger and the flowers did seem bigger overall. Upon looking at photos from 3 years ago, it may look a bit bigger but I still can’t confirm it so I will err on the side of safety and say it hasn’t. Either way I still feel this artwork is beautiful but it is nearly impossible to capture the total beauty in a photo. 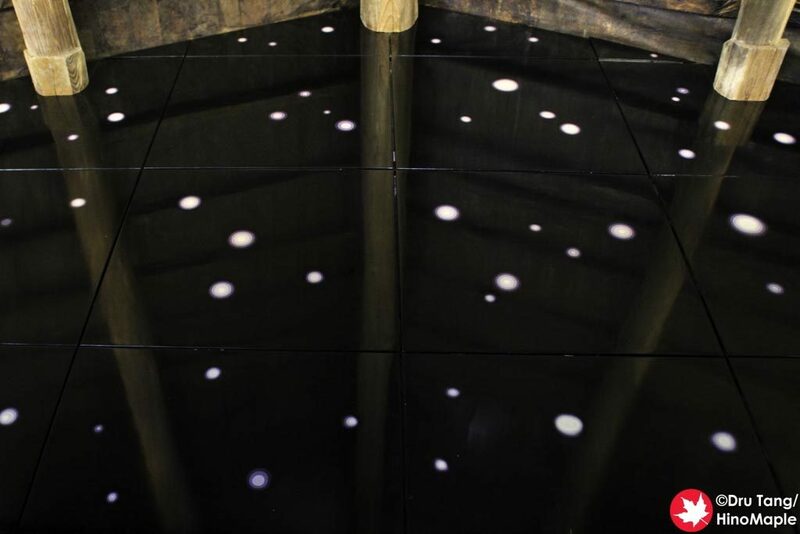 Rotation – Revolution is a new artwork by Lin Tianmiao that didn’t really speak to me in any way. It is basically an installation in a house that takes up several rooms and utilizes many old objects from the island. They are all attached to rods and then rotated slowly. Looking at Ms. Tianmiao’s other works, I can see a similar theme but it is not my cup of tea at all. If you like it, hats off to you but I’m afraid it is lost on me. Organ by Tomoko Taniguchi is one of the fun artworks on the island, but you really need other people to play with you to enjoy it. The artwork spans about 15 meters and you cannot see one end from the other. Most people will approach it from the base which has no real meaning. It is basically a big game of telephone with PVC pipes. When you get to the top that is where the fun comes as they have plungers that act as accordions that play music. In total, in order to enjoy the artwork completely, you need about 4 people. Memory Bottle by Mayumi Kuri was one of my favourite pieces of the 2013 Setouchi Triennale. It is one of the pieces that made me fall in love with Ogijima and it continues to impress me. The outside of the store room is pretty nondescript but when you enter you are hit by the memories of Ogijima. 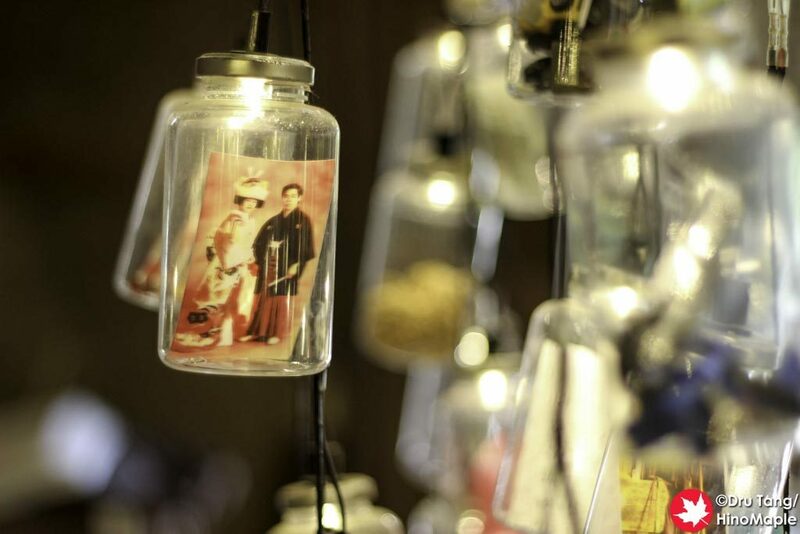 This artwork is something that must be experienced as there are hundreds of bottles all hung with various pictures and trinkets from the island. It is a beautiful exhibit that must be seen as no photos or descriptions can really help you appreciate it. 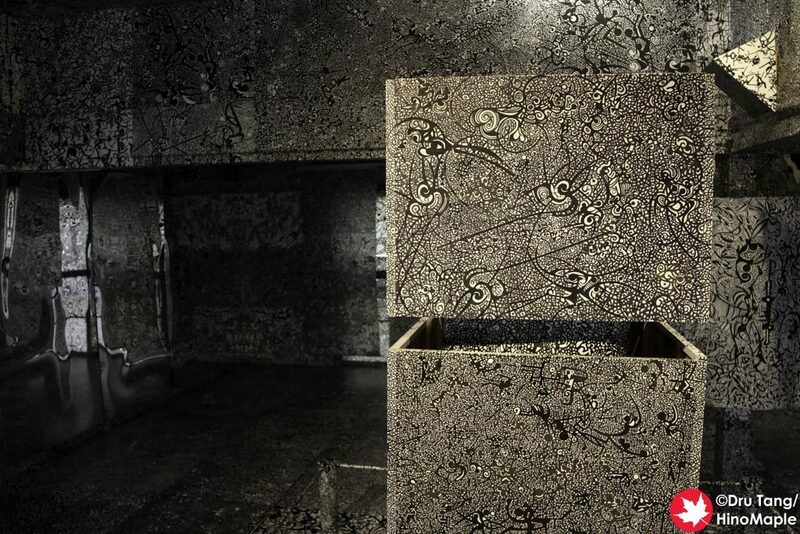 Maison de Urushi is a special project that utilizes the local lacquer techniques of Kagawa. There are 2 main rooms with the first room being the black room. There were several layers of lacquer on the walls with a white base and then several layers of black. They cut down through the layers to provide white dots all over for a very impressive artistic look. 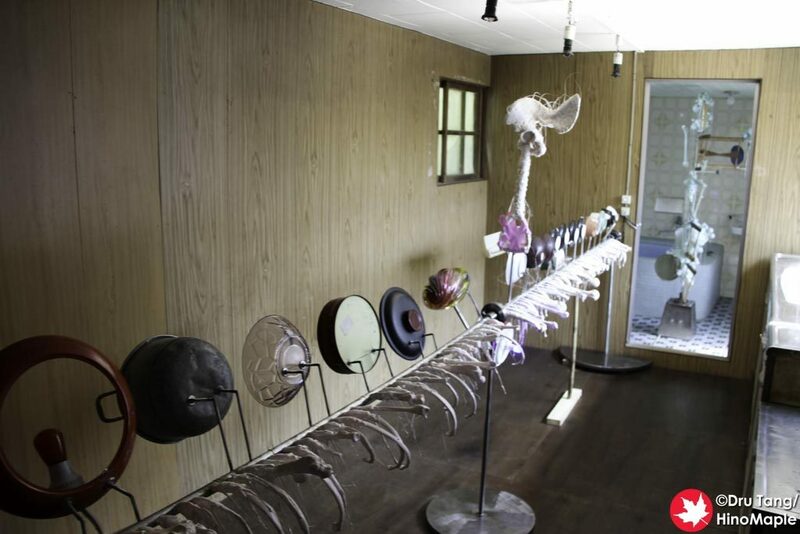 The second room is a white lacquer room with a beautiful view and a beautiful closet. I’m a little torn as to which room would be better to be all white as the white room has a view and the natural light made it very bright, but a black version would provide a great contrast for the view and focus on the view. The black room was the opposite as it provided a dark atmosphere making it white would have brightened it up a lot. Oscar Oiwa tends to impress with his artworks and his “The room inside of the room” doesn’t disappoint. At first, you enter the main house area and the courtyard is a really nice area to just relax. Once you enter the house, you walk towards the room inside the room and it is very unsuspecting. You don’t really realize what you are walking into until you actually get into the room. I knew what to expect but I was still amazed by what I saw. The entire design along with the art on the main wall is beautiful and must be seen to appreciate it. It is definitely one of the best artworks on Ogijima and I hope it will be available in 3 years too. Right next to the harbour, a new Ogi School PSS40-The Group 1965 has been set up. 3 years ago they used the old school but now the school has been torn down and they rebuilt it. With the school being used as a school, they had to change locations. Makoto Aida is the leader of this installation with his family living with him on the island during the summer edition of the Triennale. There are several workshops and chats and I was lucky enough to listen to a chat by a few of the grandmas of Ogijima. The artwork was not particularly interesting to me, but some of it was turned off for the workshop and some of it was not complete as it was a work in progress, to be completed by the end of the summer session, or even at the end of the Triennale. TEAM OGI continues to display some of their cool artworks all over the island. The OGI Project is part of that but unfortunately nothing is new for 2016. The fishing boats were originally painted 3 years ago with some local folklore as well as various seascapes. I was really impressed by it 3 years ago and I’m still impressed this year. I have gotten used to it so it doesn’t invoke the same amazement as before but it is still a great work that needs to be seen. Do note that while the main boat is in the main harbour, several boats are also in the fishing village near “Walking Ark”. Walking Ark by Keisuke Yamaguchi is a nice looking artwork that I just didn’t care for. I think it is nice and a great symbol from afar but up close I didn’t care for it. It hasn’t changed for 2016 and it is still fun to see for the first time but this time I kept my distance and only enjoyed it from the harbour rather than going straight to it. I believe this is an artwork that needs to be played with, especially in a group, as I often see photos of groups of girls poking their heads out from between the legs of Walking Ark. 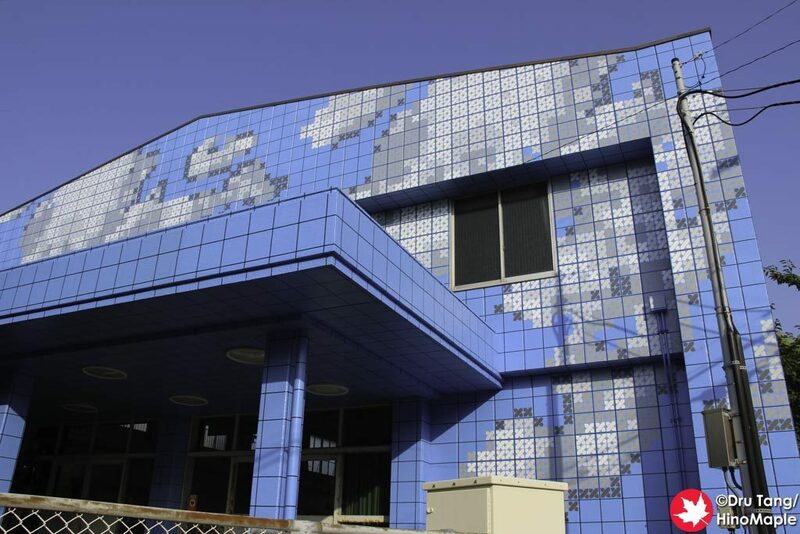 Dreaming of Blue by Regina Silveira is a very interesting artwork covering the front of the elementary school gym on Ogijima. Whenever I saw it in pictures, I never really liked it but when I got there and could see it clearly, I really liked it. From many of the photos I have seen, it is nothing more than a blue background with various white and grey tiles. When you look at it completely, it actually looks like the sky with a few clouds in it. It is a more beautiful than you can imagine and I really enjoyed how it made me feel. The above is my own personal review of the art on Ogijima. If you want to be surprised by the art, I recommend that you do not read more than what is written here. Links will follow the single paragraph describing the basics of the artwork when the posts are ready. Please keep an eye on the social media accounts (Facebook, Twitter, Google Plus) for information when they go live. Photos may also give away part of the art, but in this post, they are minimal. Spoiler alerts in individual posts will be given when it is necessary for you to enjoy the art for the first time. If you will not be going to the Setouchi Triennale, feel free to follow the links and read everything and enjoy it as best as you can. Links to individual art reviews will be coming in the following months as soon as possible. 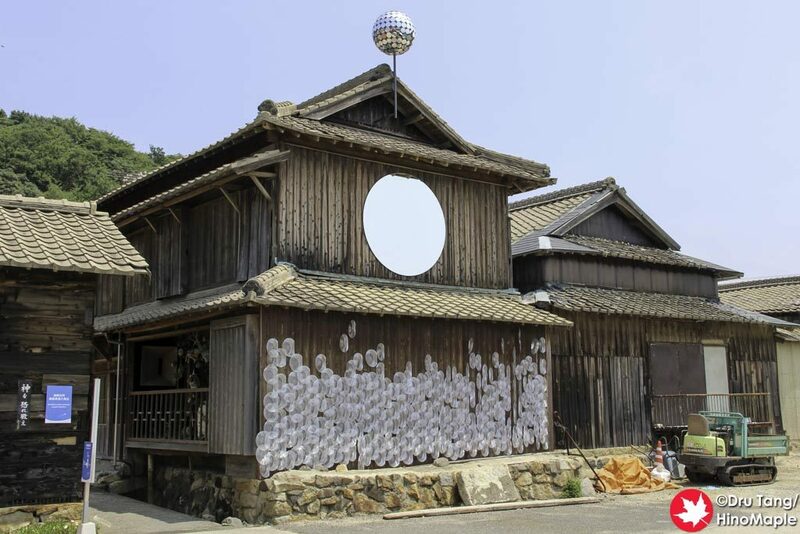 This entry was posted in Setouchi Triennale, Shikoku and tagged 2016 Setouchi Art Festival, 2016 Setouchi Triennale, art, japan, Kagawa, Ogijima, Setouchi, Setouchi Triennale, Takamatsu, Triennale by Dru. Bookmark the permalink. I miss it too and it has only been a few months! Some of the artwork may be gone soon as the Triennale has ended. I think Lighthouse Keeper and Rotation – Revolution will be gone. 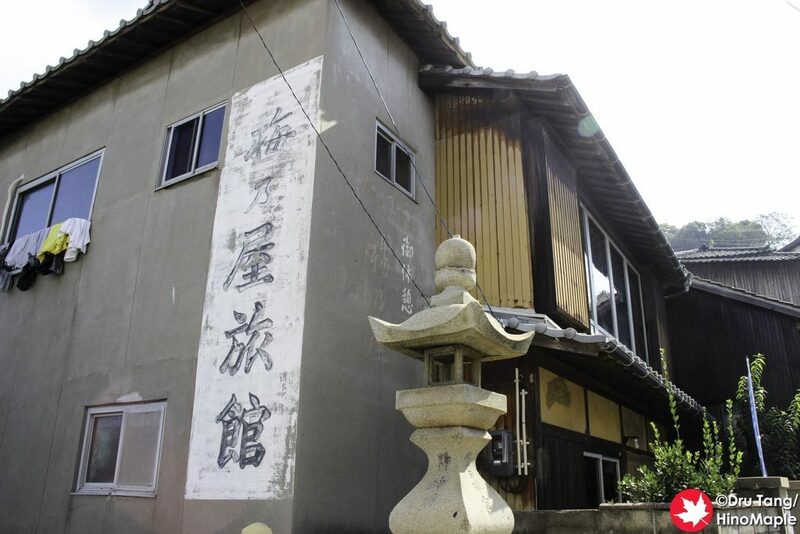 Pretty sure Ogi School is gone but will probably be back in 3 years. Not sure about Akinorium or Room Inside a Room either, but the rest should still be there for the future.